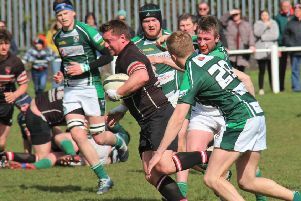 Alarming defensive lapses cost Heath dear as they slipped to a 27-13 defeat by York at North Dean yesterday. Home coach Kevin Plant counted six missed tackles in the build-up to one of the visitors’ four tries as his side blew a chance to move closer to Yorkshire One safety. A strong effort from the North Dean club’s pack, particularly in the scrums, counted for little as Heath were unable to paper over the cracks in their back line. Ex-skipper Dave Montgomery and promising Jack Sheldrake were drafted in from Scotland and university respectively to shore up the midfield but the back three, all changed from the previous week’s mauling at North Ribblesdale, proved vulnerable. Heath, with a target of two more wins from their final seven fixtures, started promisingly. Montgomery, normally a flanker but adapting quickly to his centre role, sent Ian Downsborough charging over half-way and when York were offside just outside their 22 Ezra Hinchliffe made it 3-0. The lead lasted only three minutes. Scrum half Dom Walsh got back to hack the ball into touch but York’s quick lineout caught Heath napping and lock Dave Bates strode in from 10 metres for an unconverted try. A superb kick put York back on the attack and the visiting forwards were held up over the try line as the sunshine gave way to a heavy shower. Good work from front row duo Mark Puttick and Olly Cook helped clear the danger but York returned to make it 10-3 after 22 minutes. Winger Billy Cakaunitabua had little room to work with near the left-hand touchline and two defenders in front of him but had little difficultly in breaking the tackles to score. York knocked on Ezra Hinchliffe’s deep restart and were unable to escape as the home pack got the bit between their teeth. York No 8 Marcus Britland was yellow carded as the home forwards drove for the line and Heath eventually got there, hard-working Hamish Pratt scoring in a pile of bodies. Hinchliffe’s conversion made it 10-10 after 28 minutes. Heath lost giant lock Fergus Marsden with a knee injury before York restored their lead through Bates, who looked almost embarrassed by the ease with which he shrugged off the tacklers on his way to the line. Fullback George Davies converted on 37 minutes and the score remained at 10-17 when Hinchliffe missed a good chance for three points with the last act of the first half. Heath pressed after the break and Cook was bundled into touch three metres short of the try line. A Hinchliffe penalty hit an upright on 50 minutes but he was on target with a sweetly-struck 40 metre effort five minutes later. Fly-half Hinchliffe put Heath back on the attack with a superb touch-finder, only to pass the ball over the sidelines shortly after. York returned to home territory and immediately made it 13-20 on 65 minutes through Davies’s long. straight penalty. The visitors pressed again and landed the knockout blow on 71 minutes with Heath’s Si Brown in the sin-bin. Pratt held up a York forward over the line and although Heath took the scrum against the head, a poor clearance to touch left them under the cosh. York duly won the lineout and their forwards rumbled to the line where prop Daz Rutherford got the touchline, Davies converting. Heath didn’t throw in the towel and Pratt and Cook went close before York cleared to half-way, where replacement Rob Depledge was yellow carded for a tip-tackle.